Do you need more freezer space than your fridge offers? And don’t want to break your back with a chest freezer? Consider investing in a Frigidaire upright freezer. The refrigerator in your kitchen may be convenient, but let’s face it, it just doesn’t have enough freezer room. A Frigidaire upright freezer solves that problem once and for good. Stop struggling to stack and pack frozen goods into the tiny freezer compartment of your refrigerator. Make room for your ice trays, frozen treats, meats, vegetables, and more by researching and purchasing the best Frigidaire upright freezer for you. We’ve taken the liberty of reviewing the best upright freezers of 2018 to make the process as simplified as possible. There is no time like the present, so, what are you waiting for? Before we get started with the review, here are some answers to the most frequently asked questions regarding purchasing a Frigidaire upright freezer. Frigidaire is one of the most well-trusted manufacturers of refrigerators and freezers in the world. They have been in business since 1916. What is an upright freezer? An upright freezer has a front opening door, in comparison to a chest freezer which has a lid that opens from the top. 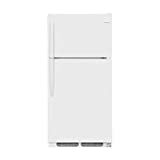 What qualities determine the best Frigidaire upright freezer? Size, power usage, amount of shelving, depth, temperature range and control types are some of the main aspects which help to determine the quality of a Frigidaire upright freezer. How do upright freezers work? Upright freezers work in the same manner as refrigerators and chest freezers. Gas is heated, cooled into liquid, and then heated again. The process removes heat from within the upright freezer vs. creating a source of cold air. Eventually, all heat transforms into cold, and freezing temperature is achieved. Where can you buy the best Frigidaire upright freezer? Most local department stores carry this brand. 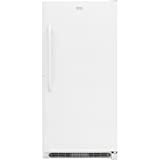 Online, you can purchase a Frigidaire upright freezer from Amazon, Lowes, Home Depot, and Sears as well as Frigidaire. How much power does a Frigidaire upright freezer use? 800 watts to 2,000 watts of electricity are required to operate an upright freezer continually. However, Energy Star certified freezers use between 10 percent and 50 percent less. The following list is made up of only the best upright freezers from Frigidaire for you to purchase in 2018 (in no particular order). Built with American Pride: Designed, enginereed and assembled in the U.S.A. The mid-sized 14.4 cubic foot Frigidaire upright freezer has adjustable temperature controls, bright interior lighting, defrost and removable drains. It has an exterior made of textured steel, a power-on indicator, and a temperature range of negative 10 degrees to 10 degrees. Also, it comes with a 1-year limited warranty and is non-returnable. Dimensions include a height of 62.12 inches and a depth of 32.25 inches and a width of 32.25 inches. Pros include a safety lock with a pop-out key, thick arcticlock walls, three wires shelves, and an affordable price. Furthermore, there is the option for a 5-year Home Depot protection plan. This little cutie comes with a temperature range of negative 7.6 degrees to 3 degrees and an outer temperature control dial, as well as a manual defrost and five wire shelves. Dimensions for the freezer are 56.1 inches in height, 22 inches in depth, and 27.5 inches in width. And it is lightweight, being only 89 pounds. It comes with a 1-year warranty though it is non-returnable. Doesn’t get quite as cold either. 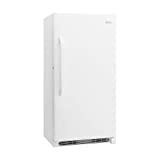 Another mid-sized Frigidaire upright freezer, this one comes with a clean white finish, dial shaped temperature controls, and frost free operation. As well as LED lights on the interior. Also, it comes with a 1-year limited warranty and the option to upgrade to a 5-year protection plan from Home Depot. Dimensions are 62.12 inches in height, 30.5 inches of depth, and 29.62 inches in width. It weighs approximately 150 pounds. The 16.6 cubic foot Energy Star Frigidaire upright freezer comes with a power-on light, LED interior lights, adjustable temperature, and frost free operation. It has a side air clearance of three inches. Also, it comes with a 1-year warranty. Dimensions for this product are 67.69 inches in height, 32.25 inches in width, and a depth of 28.5 inches. It weighs 174 pounds. The 20 cubic foot frost free Energy Star Frigidaire upright freezer has an internal temperature control dial, six easy to clean full-width door containers, LED lights, rounded door, and white stainless steel exterior. Dimensions include a height of 73.18 inches and 30.5 inches of depth. It weighs 195 pounds. Also, It comes with a 1-year limited warranty and is eligible for a 5-year protection plan from Home Depot. We couldn’t find many cons with this one, other than the fact that it is a bit taller than other upright freezers. The second 16.6 cubic foot Energy Star certified Frigidaire upright freezer on the list; this one is a bit more heavy duty. It comes with a color coordinated steel door and handles that match the inside shelves. As well as fully adjustable temperature controls, power on indicator light, and frost free operation. Dimensions are 67.7 inches in height, a 32.25-inch width, and 28.5 inches of depth. It weighs 163 pounds. This big boy of a Frigidaire upright freezer comes with adjustable temperature controls, including an internal temp dial, a steel door, power on light as well as interior lights. It comes with a 1-year warranty and the option to upgrade to a Home Depot 5-year protection plan. Dimensions include a height of 62.38 inches, a depth of 30.5 inches, and a width of 32.25 inches. The weight of this product is 185 pounds. One of the best Frigidaires that we had the opportunity to research. This one comes with advanced temperature controls, power-on indicator light, and frost free operation. It is also has a color coordinated steel door, handles, and interior shelving. Also, it includes a 1-year upgradable 5-year protection plan from Home Depot. Dimensions include a height of 73.19 inches, a depth of 32.25 inches, and a width of 34 inches. The 17.4 cubic foot Frigidaire upright freezer is the last item on our list. It comes with an internal temperature gauge, three wire shelves and five easy to clean door bins. In addition to a white steel door, power-on indicator light and a manual defrost. Also, It comes with a 1-year limited manufacturers warranty and the option for a 5-year Home Depot protection plan. Dimensions include a 67.69-inch height, 32.25-inch depth, and 34-inch width. It weighs approximately 150 pounds. The bottom line? We found that the 20 cubic foot upright freezer is the best deal currently available. Not only does it have all of the bells and whistles that you could want in a Frigidaire upright freezer, but it also offers more space than your average upright. As well as coming with a 1-year warranty, upgradable to a 5-year protection plan, and an excellent price. If you're serious about investing in a Frigidaire upright freezer, you can’t go wrong by purchasing this product. Energy Star certification, removable shelving, safety locks, and superior depth along with a good price tag make this the best deal by far. We’d love to know what you think about our list. Have you recently purchased, or currently own, a Frigidaire upright freezer that wasn’t included on our list? Let us know all about it in the comments below! Previous articleFrigidaire FFFU21M1QW Upright Freezer: Is This Right for You?